Form Description: Keep track of all your materials and supplies. This form works best laminated and used with a dry-erase marker for a perpetual tally of your current stock. This form includes a table for the items being tracked. The table includes item number, description, the current quantity on hand, and the last date on which the quantity was updated. Know what you have at all times! This form is in two-per-page portrait format. 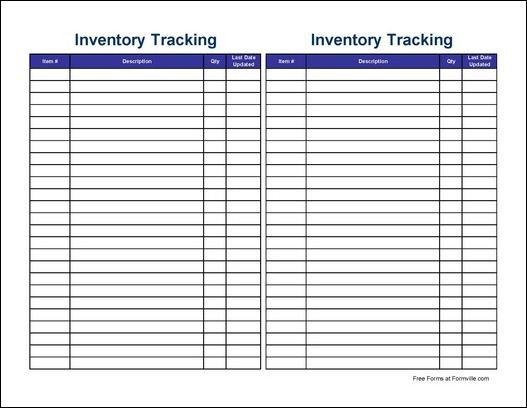 You can download a PDF version of the "Small Simple Inventory Tracking Sheet (Tall)" form absolutely free. You can also, for a small payment, download a fully editable version of the form that you can customize as you desire. (Don't know which format to choose? Here's how to make your choice.) What would you like to do? Formville's free "Small Simple Inventory Tracking Sheet (Tall)" form is associated with the following keywords: inventory tracking, inventory use.